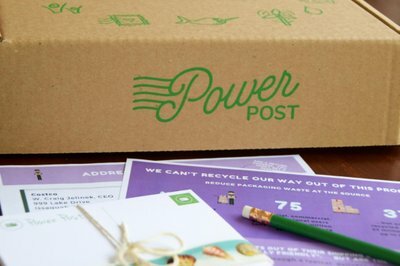 Enter your email address below to receive a notification when Power Post starts accepting new sign-ups! 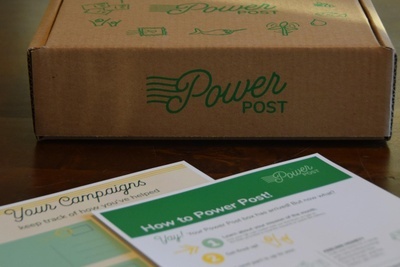 Enter your email address below to receive a notification when Power Post is accepting new sign-ups again. Starting in February all orders will be sent the 7th of each month. Orders must be in by the 27th of the previous month. WE SHIP ALL ORDERS ON THE THE 7th OF EACH MONTH. (closed July and August) For example: if you order by February 27th, the box will be sent March 7th. Busy? You can still fight the Green fight. 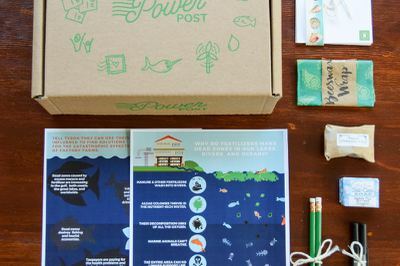 Inside your Power Post box, you'll find supplies for a postcard campaign focused on a specific environmental issue each month. 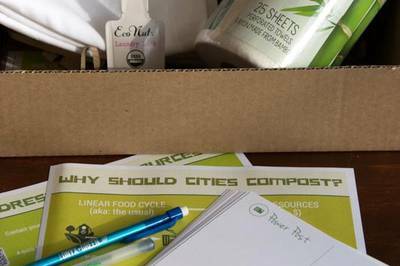 We gather all the information for you, plus talking points, addresses, and some goodies to help you reduce your own carbon footprint. Then simply gather family, friends, or just a beverage, and make your voice heard. 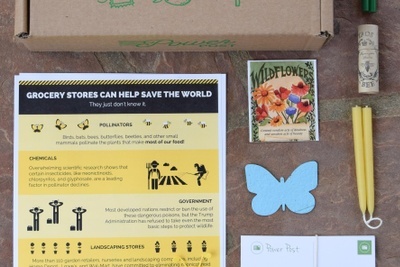 Great gift for the activist or environmentalist in your life. Focus on experiences, not stuff. Gather friends and family and complete the missions together. I got to use this box at a friends party, and it was SO GOOD! It was educational and fun, and I can't wait to try it again! 100% would recommend! 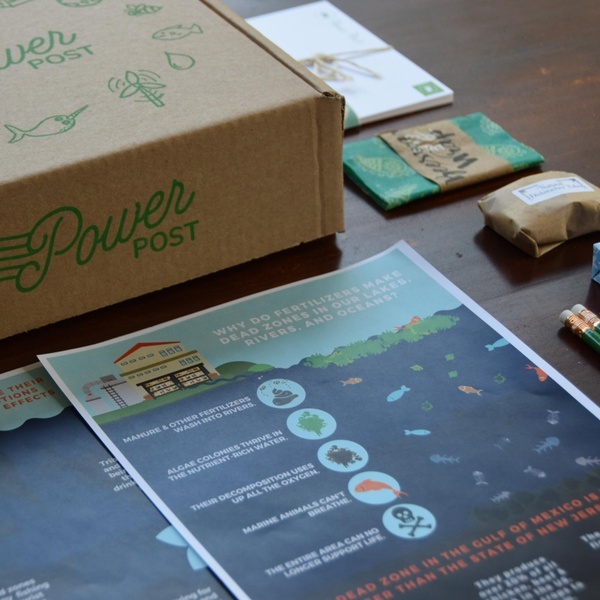 Our "Save the Planet Box"
Power Post is great way to stay informed about environmental issues and to be an advocate for change without being overwhelmed. 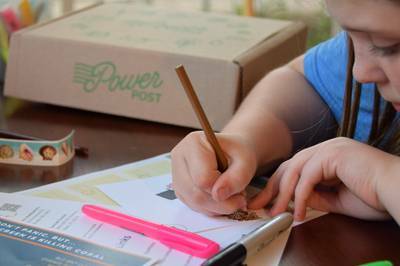 As a busy Mom, I don't have a lot of extra time, but this subscription box makes it possible for me to stay involved. The boxes are very well put together! The topic card is always very informative, with easy to follow key notes that explain exactly why the monthly topic is important and what we can do to push for a positive change. And... the goodies are great!! 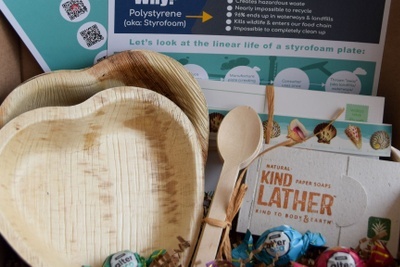 We love our beeswax wraps, our sunscreen bar in a tin, and our bulk food bags. 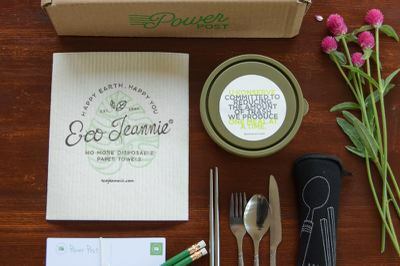 The reusable straws and take-out silverware set are perfect to keep in the car, and the bamboo "paper" towels lasted forever. 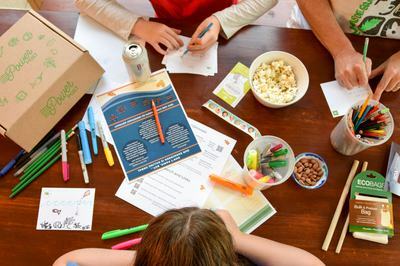 Having this subscription box has also been a great way to keep the family informed and involved. My 9 year old son calls it our "Save the Planet Box". It's not like most other subscription boxes, just to treat-your-self (although the goodies are fantastic), it is so much bigger than that! I highly recommend for anyone who gives a damn. I was so intimidated writing to local officials or calling them. This box was an amazing answer. All the talking points were there so that I felt very informed about all the topics; I mean, I could explain them myself and talk to a rep without a script! Amazing. It's super convenient that stamps are included, cause who has time to go to the post office for that? The treats are an added bonus. The first box was full of laundry supplies. I had literally just been lamenting dryer sheets and how much of a waste they are. Those dryer balls are awesome. I will totally be using those from now on. This last box had chocolates. 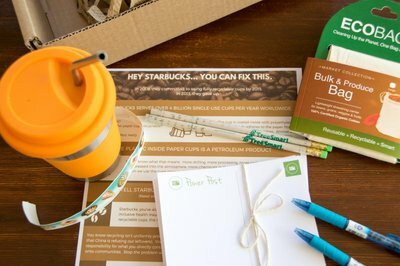 Who doesn't want those when they open their mail? 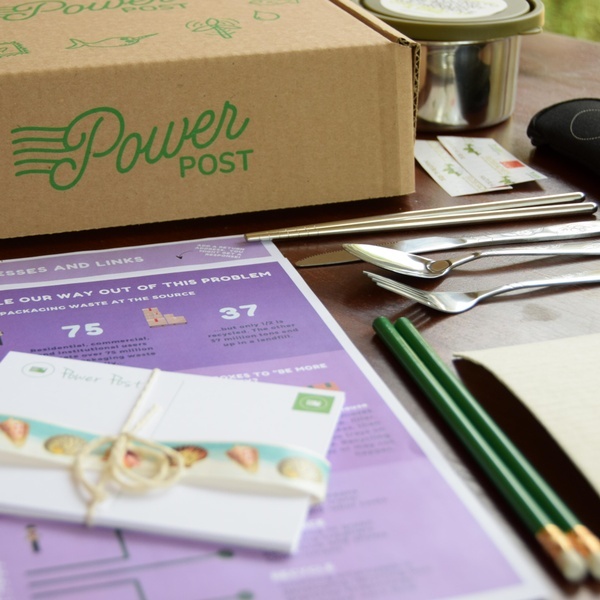 This has been a great subscription box service and I feel great knowing that I'm doing something not just for me but something that's good for everyone and the environment. 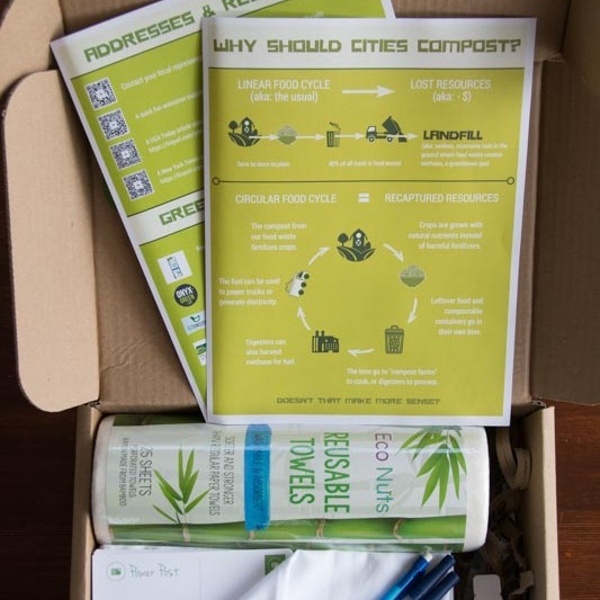 Learn why our garbage is an important resource, and encourage your leaders to use it. 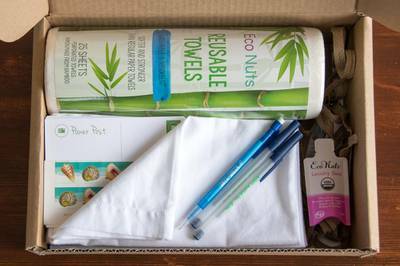 Goodies: bamboo towels, napkins, natural detergent.. Learn why over-fertilization causes dead zones, and tell Tyson Foods to clean up their factory runoff. Goodies: wax wrap, bar shampoo, and..